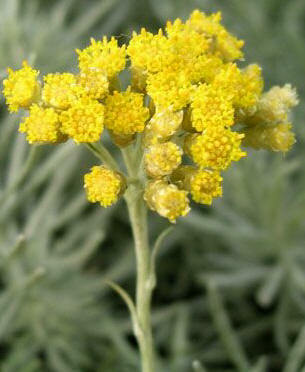 Like most varietals of Helichrysum, Helichrysum gymnocephalum possesses a unique chemical profile and differs significantly in therapeutic properties from other species of Helichrysum and specifically from the more popular H. italicum. Helichrysum gymnocephalum, typically grown in Madagascar on wild shrubs with aromatic small yellow flowers, has a fresh, camphoraceous, eucalyptus-like aroma. The branches are covered by white, fine hairs that are harvested for this oil. While Helichrysums in general make positive contributions to aromatherapy, recognition of the dramatic differences between the species, and specifically the benefits of Helichrysum gymnocephalum, make for an interesting study. There are over 600 species occurring worldwide. Common to all of them is the word “Helichrysum” derived from the Greek word “Helios” meaning sun and “chrysos” meaning gold. However, the similarities are few and the differences are great as the chemistry of the various helichrysums differ significantly. A common misconception is that the “Helichrysum” from Madagascar is inferior to the Helichrysum from Croatia or Corsica, when in fact they are completely different oils. The Latin name becomes very important when talking about Helichrysums. As there is general confusion among us concerning the different Helichrysums, I have included a brief comparison. The Helichrysum most people are familiar with is Helichrysum italicum, known as everlasting and immortelle, commonly grown in Croatia, Bosnia, Corsica, the US (California), and recently has become available in Albania. Helichrysum italicum, as in all other essential oils, can differ in chemistry depending on the soil and climate of the area. For example, Helichrysum italicum from Corsica and Croatia are both excellent oils that possess strong wound and injury healing along with cell regenerative properties due to the ketones, italidones, di-ketones and the sesquiterpenes-curcumenes (Bowles, 2003; Schnaubelt, 1998). Analgesic, antibacterial, anti-infectious , anti-inflammatory, antimalarial, antiseptic, antiviral, decongestant, expectorant, immunostimulant, mucolytic, and tonic for the nervous system. Oxide 1,8 cineole comprises a large percentage of the chemical components in Helichryrsum gymnocephalum (the referenced batch in this article being 66.36%). Oxide 1,8 cineole is the primary component that sets this oil apart from other Helichryrsum species. Monoterpenes comprise approximately 16% of Helichryrsum gymnocephalum, in the form of α-pinene and β-pinene. α-pinene is anti-inflammatory, antibacterial, antispasmodic, antiviral and anti-fungal (candida). β-Pinene is found to be a potent scavenger of hydroxyl radicals (Billany et al, 1995). It is suggested that monoterpenes achieve success when added to topically applied products for the relief of muscular and rheumatic pain. Analgesic and anti-inflammatory: 1,8 cineole produces anti-inflammatory and analgesic effects (Santos, 2000). Anti-infectious: Eucalyptol (1,8 cineole) has a strong anti-infectious capacity, particularly against viruses, which is reinforced by the presence of limonene and α-pinene (Penoel, 1992). Antibacterial and Antiviral: 1,8-cineole inhibited the growth of 16 out of 17 gram-positive and gram-negative bacteria (4), showing an antiviral action against HSV-1 (Astani et al, 2010). Decongestant: 1,8 cineole shows improvements in breathlessness and lung function (Worth et al, 2009). Mucolytic: 1,8 cineole anti-inflammatory and mucolytic action appear to assist in helping of the upper and lower airway diseases (Jurgens et al, 2003). In a 12-week placebo-controlled clinical trial, patients with severe asthma were able to reduce their consumption of glucocorticosteroid medication by 36% in the group taking 1,8-cineole capsules, compared with 6% in the control group (Jurgens et al, 2003). Antimalarial: The use of Helichrysum gymnocephalum against Malaria is being explored and this is one research article (Afoulous, Samia et al 2011). Helichrysum gymnocephalum shares similar properties as Eucalyptus globulus. In my personal experience, I have found it to be a more gentle oil versus E. globulus due to the lower 1,8 cineole content (66.36% versus 73.65% respectively). I would choose this oil when making blends for the elderly and young children. The aroma is more vibrant, deeper, and sweeter than the E. globulus making it a great choice for inhalers, diffuser blends, or added to a carrier. When I use this oil in various blends, I feel support for my respiratory system (facilitating deeper breathing), improved mental clarity and creativity depending on the purpose of the blend. Oils distilled from flowers traditionally represent new growth and are associated with the head and heart. They are often calming and are said to boost self-confidence, emotional support, and renew energy.